Tea has a long tradition as both a beverage and a social event (1). In turn of the 20th century America, tea was enjoyed both at home and in public tearooms, by men and by women (1, 2). At a time when women were typically excluded from other public dining rooms, it was considered acceptable for women to go to tearooms with or without male escorts (1). Whether taken at home or in public, teatime was an event requiring several pieces of equipment. For a respectable tea, etiquette and cookbooks from the 19th and early 20th centuries list non-negotiable items as a teapot, teacups and saucers, a jug for cream, and a bowl for sugar (2). Tea services were often beautiful objects made of fine china or silver, intended to be displayed and admired by guests. Z.S. & Co Sugar Bowl from the Brody/Emmons Complex. 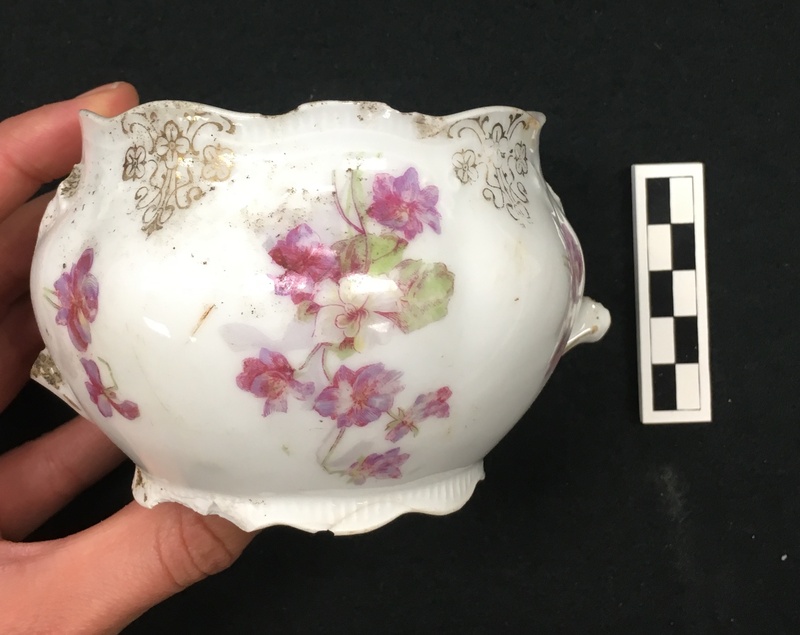 CAP archaeologists recovered one of these beautiful objects, a flowery porcelain sugar bowl, during excavations at Brody/Emmons complex, the former site of the East Lansing city dump. 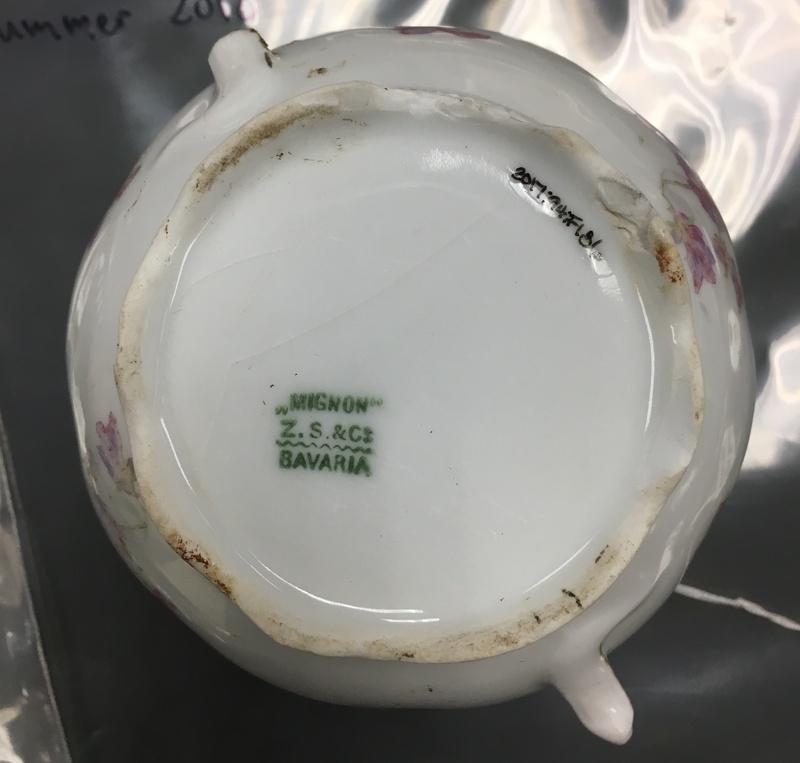 Luckily for us, the bowl is nearly intact and displays a backstamp on its base reading “MIGNON Z.S.& Co. BAVARIA.” This stamp provides several key pieces of information about the item, starting with the name of the manufacturer. Z.S. & Co refers to Porzellanfabrik Zeh, Scherzer & Co., a German company that produced porcelain tableware, coffee and tea sets, and other decorative items from the time it was founded in 1880 until 1992 (3). The backstamp also gives us a clue as to a date. Manufacturers often changed the design of their backstamps to reflect new ownership or updates. Z.S. & Co. used the plain green mark with the name of the company and place of manufacture divided by a wavy line between 1880 and 1918 (3). Makers mark on base of Z.S. & Co Sugar Bowl from the Brody/Emmons Complex. The backstamp also tells us where the bowl was made: the German state of Bavaria. Until the 1700s, the best quality china was made in, well, China (4). In the early 18th century, German manufacturers in Saxony discovered the secret to producing high quality porcelain using a combination of kaolin and alabaster. The Meissen porcelain factory near Dresden was the first European company to successfully manufacture and market hard paste porcelain. By the height of china production in the late 1800s, there were hundreds of porcelain factories and workshops in Germany. German china gained a formidable reputation for its quality and beauty. Starting in 1887, many companies began stamping their wares with the label “made in Germany” to differentiate them from competitors, primarily the English workshops in Staffordshire. The inclusion of this phrase served as a proxy for quality (4). Some German porcelain simply includes the region of manufacture, such as Saxony, Bavaria, or Prussia (3). Until the 20th century, many porcelain items were imported from Germany. However, anti-German sentiment at the beginning of World War I reduced demand for many German goods in America. 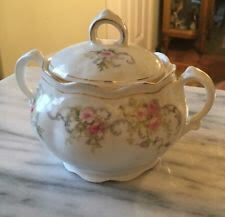 Mignon style sugar bowl. Image source. Finally, the word “Mignon” on the backstamp refers to the name of the series. Z.S. & Co. produced various styles of dishes including the Mignon, Orleans, and Punch series (3). Dishes in the same series had the same shapes, but were available in a wide variety of patterns. The Mignon sugar bowl recovered from the Brody dump has the same shape as a Mignon sugar bowl I found on Ebay, but it is painted in a different pattern. The CAP sugar bowl is decorated with pink and white flowers and green leaves and flowery gold fleur-de-lis near the rim. The pattern itself actually tells us about how the piece was made. The flowers are crisp, multi-colored and multi-dimensional in that they exhibit shading. This indicates the use of ceramic decals, a technique involving the transfer of an image printed on special paper onto a ceramic object (5). This process is much faster and requires less skill than hand painting. The advent of this technique in the 19th century allowed for mass production of affordable china (5). It is impossible to say for sure why the sugar bowl ended up in the East Lansing dump, but a likely explanation is that it was broken. Delicate pieces of a tea service get picked up and passed around quite a bit, leaving ample opportunity to drop, chip, or smash them. The sugar bowl recovered from the dump is mostly intact, though it is missing two handles and is chipped in several places around the base. It is possible some of this damage came from being buried in a landfill. However, it is easy imagine that its owner decided to discard it after a few too many exuberant tea parties rendered it no longer fit for display. Smith AF. 2013. Tea. In The Oxford Encyclopedia of Food and Drink in America. Retrieved from http://www.oxfordreference.com/view/10.1093/acref/9780199734962.001.0001/acref-9780199734962. Tags: ceramic, sugar bowl, Tags: Brody-Emmons Complex, Z.S. & Co.